This is my newest prop to help me with teaching religious education. I couldn't think of a better saint to join me than Padre Pio. Teaching younger children requires plenty of visual aids. I like to keep things interesting and exciting. Which is why in my classroom I use the chalkboard, erm, I mean dry erase board constantly. I like to draw pictures to go along with the lessons. Some of my drawings are very good and others are rather, well, silly looking. Truth be told the children REALLY love it when my drawings are silly. I agree usually the silly looking ones provides us with a fantastic amount of laughing. When it comes to teaching confession I need something more than a simple or even silly drawing. For some time now I have been looking for just the addition to my classroom. I think that I found just the thing in this saint doll. It will be incredibly helpful being incorporated into my lessons. Not only is this doll just a delight to look at it will also put an image in the minds of the students. Teaching them about the importance of a good confession by using Saint Padre Pio is going to be wonderful. Padre Pio is a saint known for his special talent at drawing people to confession. He was a Capuchin monk from Rotondo, Itlay. For more than 50 years he bore the crucifixion wounds of Christ, the stigmata. His ability to read the hearts others allowed him to see if confessors were making a good confession. If a person came to confession and forgot a sin, either intentional or unintentional, Padre Pio would remind the person of the forgotten sin. This ability provided confessors with a complete confession giving countless people the opportunity to be filled with sanctifying grace. How amazing! Sure it would be a little upsetting, especially if you were on the less than truthful end of confessing, but think of the amazing fulfillment you would get in return. Truly a humbling experience. 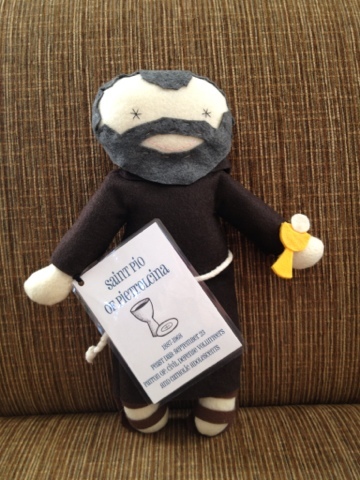 If you would like to order a saint doll of your own I purchased mine from the Etsy store Handmade by MegK. She has all types of saint dolls. I'm thinking about buying her Mass kit. That looks like it would be very helpful in explaining the mass to my students. Maybe that will be my new visual aid for next year's class.